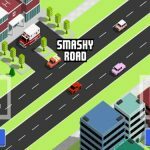 Bearbit BV’s Smashy Road: Arena is a new game in the company’s Smashy Road series, coming right after Smashy Road: Wanted, which was a single-player game that reminded us of a more casual twist on the old Grand Theft Auto-influenced cop chase mechanic. Likewise, this game involves a lot of running from the law, but this time, you will be picking up your weapons and doing battle against “real players” in a battle arena of sorts. There are 30 unlockable vehicles and 30 different colors to paint your cars in, if customization is your thing. You also get ten unlockable weapons and eight different environments, though one of the fun things about this game is that the levels are generated procedurally – that means all the levels you play in are randomized, making one run no different from the other. Unlike other games in the casual genre, the vehicles and weapons have their own unique attributes and capabilities, their own strengths and weaknesses. How do you unlock those vehicles and weapons, and how can you defeat more human opponents in multiplayer mode, and in hopes of rising up the leaderboards? Everything will be answered in this Smashy Road: Arena strategy guide, which covers all the aspects of the game you need to learn in order to be good at it. While you’re on the run from authorities, you may sometimes see some blue boxes on the road. If you drive over one of those blue boxes, you will get a new weapon as a reward. This can be very important, as you may still be in the process of recharging your main weapon once you run over them. Tap on the top left button on your screen to use that new weapon, which would serve as your “sub,” or secondary weapon; remember that all sub weapons are only limited to single-use. That means you should use your current sub weapon before picking up another box while you’re still holding that weapon. Instead of going all-out on the offensive, it’s often better to drive defensively, if you can call it that. Why do we refer to this tip as such? For starters, you have to remember that your main weapon will have to be recharged before you can fire it. 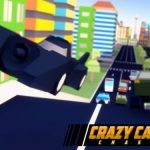 That main weapon can very easily dispatch of any type of police vehicle – with the big explosion that emanates from that weapon, you can do a ton of damage. But there is a catch – you’ll need to wait a few seconds before the weapon locks on. And while you’re waiting for the cool down period to expire so you can use the weapon again, you’ll have to pull off some evasive maneuvers and avoid the fuzz until the weapon is recharged. Don’t just avoid the cops, though – refrain from charging into large groups of cars. Although it might sound like a good idea to take things out on other vehicles and smash away, it’s arguably better to collect the cash and not fire away at the other cars. Keep a close eye on the blue and red bars on top of the screen – that’s going to give you an idea of your wanted level. If you’ve got more bars, that means more police vehicles chasing after you. So if you want to focus on collecting cash, you’ll want to refrain from attacking other vehicles. Take advantage of the time when you’ve got only one bar – that would usually be at the start of a round, and that would mean about three or so police vehicles going after you. That may sound a lot, but as you keep playing the game, you may come to a point where three cop vehicles is peanuts to you. 4. What Happens When You Spend Your 100 Coins To Get New Stuff? Take note that we said “new stuff,” and not “new cars.” That’s because spending 100 coins on the machine won’t limit you to new cars as your reward. If you don’t wish to get new cars, you can get new weapons, or you can get new colors, which don’t change the way the game plays, but rather add to the customization options for your vehicles. Swipe up and down if you want to choose a new car, or swipe left and right if you want to choose the type of reward you’ll be getting – it can be a new car, color, or weapon. There are certain things you should be looking out for in this game. For instance, staying in one place for too long will lead to the cops arresting you, and your run ending just like that. But you should also avoid bumping into other objects in front; that’s going to make your car back up after a few seconds. That’s actually a good thing; if you’re blocked from the front, you should wait until your car starts backing up, and make a quick and sharp turn to get yourself out of the jam. See those train tracks in each of the game’s levels? They go down the middle part of the levels, and they aren’t just there to add to the graphical backdrop. These are actual functioning train tracks, and you can use the trains that pass there to lure the cops to their demise. 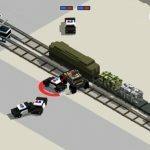 You’ll want to look for the head of the train, and once you spot it, you can easily trap police vehicles and force them to ram into the train, getting them out of the picture. 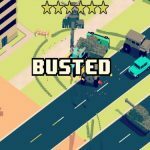 As a bonus tip, you can lure police vehicles toward fuel trucks; if you force them to drive there, they will collide into the truck, creating a huge explosion and making the cars fly into the air. No matter how many times you use your main weapon against the cops, no matter how often you think you’ve gotten rid of them, they will always be back for more. But there is a way to get rid of them on a more sustained basis. If you’ve got police on your trail, chasing after you, drive toward the water, and make a sharp left or right at the last second. This will lead the cop cars toward the water, and at least one of them would normally fall for that trap. If you’re able to pull off this move, you’ll be driving cop-free for quite a while, thus making level completion a bit easier. You’ll need your fair share of cash if you want to unlock more goodies. And fortunately, you’ll find a lot of that dough scattered around in the levels. It is possible to earn a ton of money while playing the game naturally, but you’ll want to keep your eyes out for the free gifts and watch ad videos. Hitting the Earn Cash button would launch an ad video, and once you’re done watching the 30-second clips, you’ll automatically get some cash. Typically, you’ll need about four or five ad videos in order to head to the machine and spin for new stuff. 9. How Do The Cars Differ From Each Other? We did mention that the cars in this game perform differently from each other, and serve RPG-like roles in Smashy Road: Arena. Larger vehicles, for starters, are your (non-literal) tanks; they’re slow and clumsy, but they soak up a lot of damage to make up for its lack of “offense.” Trucks can also work well for you, especially in off-road levels. Sports cars are faster on the streets, and that includes the rare F1 car. And speaking of rarity, rarer cars mean higher-end attributes and stats.